Join the celebration with Bill and Gloria Gaither as they worship with their signature blend of homespun Gospel and powerful lyrics. Love the joyous praise of the Gaither family? After a 6 year absence, this gathering brings the whole Gaither family together again! Gaither worship bring life-filled Gospel music to your home with their infectiously happy musical, and finally, after 6 years without any new releases, Gaither Homecoming returns! Featuring the firm favourites of the adored Gospel family, this all-new Gaither gathering is filled with life, filled with faith, and is all the joy of a praise celebration from your very own living room. The Gaither Homecoming returns! Featuring the firm favourites of the adored Gospel family, this all-new Gaither gathering is filled with life, filled with faith, and is all the joy of a praise celebration from your very own living room. This new collection of much-loved homespun classics celebrates the lifelong friendships that have come to form the Gaither Gospel Homecomings. They feature all the familiar faces and names who lend their vocal talents and passionate hearts to praising God in the most toe-tappingly infectious way possible: as one giant family. 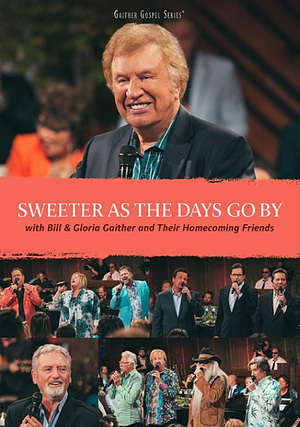 Featuring the Oak Ridge Boys, The Gatlin Brothers, Jeff & Sheri Easter, The Booth Brothers, Russ Taff, Goodman Revival, the Gaither Vocal Band and more, is Gaither Homecoming's first release in 6 years, and a testament to the vitality brought by worshipping God. It will fill your heart, bless your life, and bring you a new way to praise God with a smile on your face. Sweeter As The Days Go By DVD by Bill & Gloria Gaither & Friends was published by Capitol in March 2017 and is our 1932nd best seller. The ISBN for Sweeter As The Days Go By DVD is 0617884896720. Be the first to review Sweeter As The Days Go By DVD! Got a question? No problem! Just click here to ask us about Sweeter As The Days Go By DVD. The HOMECOMING family of artists led by Bill and Gloria Gaither gathered for an evening of gospel singing, storytelling and a celebration of lifelong friendships that have only grown Sweeter As the Days GoBy. Featuring the award-winning Oak Ridge Boys, The Gatlin Brothers, Jeff & Sheri Easter, The Booth Brothers, Russ Taff, Goodman Revival, the Gaither Vocal Band and more, this all-new DVD includes Holy Spirit Thou Art Welcome, It Is No Secret, We'll Talk It Over and Roses Will Bloom Again. First Gaither Homecoming releases in over 6 years! Featuring over 125 artists at Gaither Studios in Alexandria, IN. Each DVD over 90 minutes.